A bathroom remodel can be an incredibly rewarding home improvement project. It just takes a few features — the sink, shower and tub, and toilet — to enhance the entire space. ProSource® of Roanoke provides you with an assortment of choices for you and your client, including engineered vinyl plank, luxury vinyl tile (LVT), luxury vinyl plank (VPT), and more! The bathroom sink is a centerpiece for any bathroom. 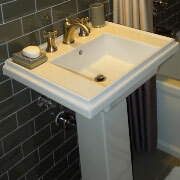 At ProSource of Roanoke, you can choose between different sink styles, types, and colors. We feature shroud, vessel, and pedestal types, so you can find the sink that best suits your client’s taste. After choosing the bathroom sink, you will want to select a faucet to match. 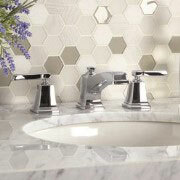 Our design team at ProSource of Roanoke can help you decide between a standard bathroom faucet or a more ornate design. We have classic, traditional, and modern faucets for your bathroom remodel. A shower should have excellent form and function. No matter what your client wants in a shower, we have options. You can choose between a head only, head and faucet, or a hand, faucet, and handle — no matter the product, you can trust ProSource of Roanoke to have high quality products at low wholesale prices. 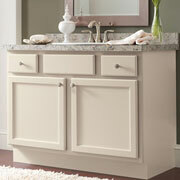 When it comes to bathroom storage, vanities are one of the few options. Vanities allow you to add bathroom storage, counter space, lighting, and a mirror all while improving the bathroom’s aesthetic. 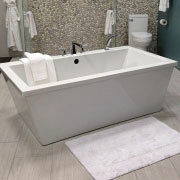 Our Roanoke showroom makes it easy to find a bathtub for your home remodel project. We have options that range from standard tubs to luxury spas. Stop by our showroom today for quality tubs at wholesale prices. 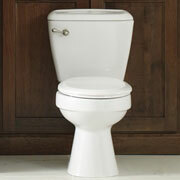 As the most-used feature in a bathroom, the toilet important to consider. At ProSource of Roanoke, we can help you find the best fit for your bathroom remodel project.